The wizard of oz has long proven to be a big draw for all ages, and now thanks to Microgaming you can enjoy it long after the movie has finished. 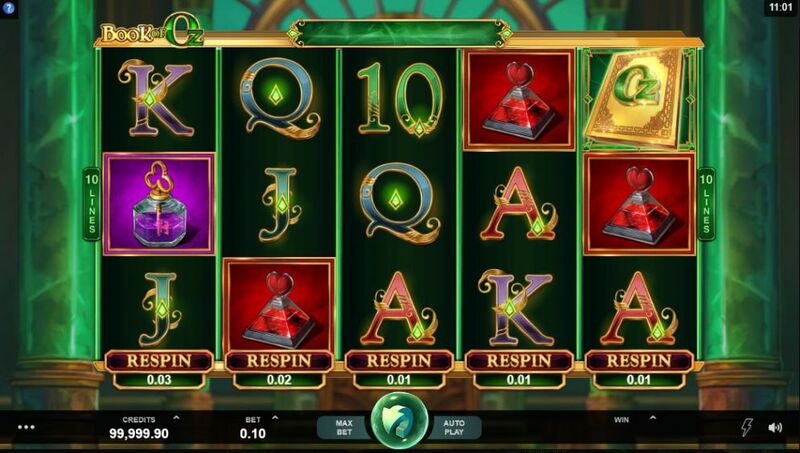 Book of Oz Respin Feature has a lot to offer you, including a reel respin offer that is really going to ramp things up. Book of Oz Respin Feature is a 5-reel, 10 fixed pay line slot, that offers all who enter the emerald palace an RTP of 96.3%. Your reels look as if they are set right inside the emerald palace itself and are full of symbols that reflect the theme too. Even the music playing along in the background almost makes you feel as if you are ensconced within a scene from the movie. Higher value symbols include the wizard of Oz and three jars, one has a lion’s head, one has a heart and the last is a four leaf clover. Each one representing something being searched for by Dorothy and her friends in the movie. Lower symbols are A, K, Q, J and 10 git edged and wrapped in vines and adorned with gemstones. 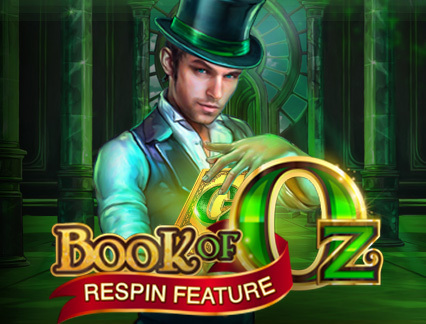 Bet Amounts – Betting on Book of Oz Respin Feature begins at 10p per spin and can be adjusted up to £25 per spin. In order to amend your bet, you need to click on the bet amount. A screen will expand upwards giving you two sliding scales to adjust. These are coin value and coin level, and once you have set the sliders to the place you want, your bet amount will be adjusted. Wild Symbol – The golden Book of Oz is your wild symbol and it will substitute for all others to help form winning combinations. It also doubles as your scatter symbol too, which is certainly a nice plot twist for the game. Scatter Symbol – As mentioned above the scatter symbol is the Book of Oz and is a double symbol taking up the position of the wild as well. But, land three or more of the scatter/wild symbol and you will trigger the bonus spins round. Scatter wins are also in play here too, offering an extra win for a set number of scatters on top of the line win. 5 scatter symbols awards a x5000 your bet amount as a win. Respin Feature – At the bottom of every reel you will see the word respin with a value attached to it. This value increases or decreases with every spin. This is an interesting addition to the game as it allows the player to spin reels individually, in an attempt to force a symbol required into view. The higher the value on the bottom of the reel, the more likely it is to complete a win and the lower the value means it’s less likely to complete a win, but not impossible. Bonus Spins Feature – Once you have landed the three or more scatter/wild symbols on the reels you will enter the bonus spins round. 5 scatter symbols awards 25 bonus spins. As you enter the round the Book of Oz will open to announce your spin total and to pick your special symbol for the duration of the round. Whatever symbol is chosen by the book will now turn into an expanding symbol when it lands. This means that if you land four of the chosen symbols on the reels then all four will expand creating a much bigger win. Book of Oz Respin Feature is a great game with some interesting twists in place to keep players engaged and entertained. The respin feature is an intriguing addition to a somewhat basic game and it certainly enhances the entertainment value. But beware of getting sucked into respinning individual reels, as it can sometimes be more costly to go this way than to just spin the reels all at once.